The spot where two or more rivers or streams meet (confluence) is called Sangama and such spots are considered sacred in Hinduism. When two rivers meet it is called Sangama and the where 3 rivers meet is called Triveni Sangama. Within the borders of Karnataka state are several confluences; the well known are Hemavati-Kaveri, Kabini-Kaveri, Arkavathi-Kaveri, Tunga-Bhadra, Ghataprabha-Krishna, Malaprabha-Krishna and Bheema-Krishna. Of all these confluences, Malaprabha-Krishna Sangama known as Kudala Sangama is the most visited. 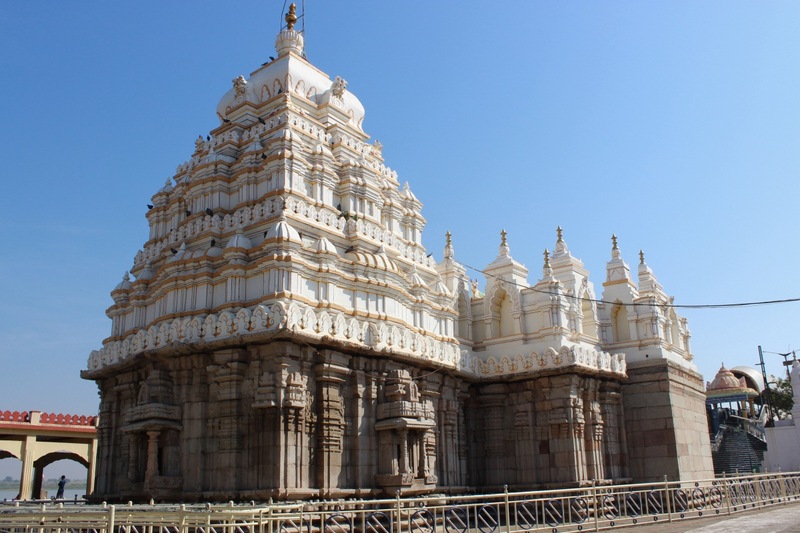 On the wedge shaped land between the two rivers stands the temple dedicated to Lord Shiva known by the name Sangameshwara Devasthana. The shrine has a long history.. the temple we see today is said to be built early 13th Century CE. However, it is said that it was originally built during Chalukyan period. The east-facing temple is built of sandstone in Jain architecture. It has two entrances, one each on the eastern and northern walls. 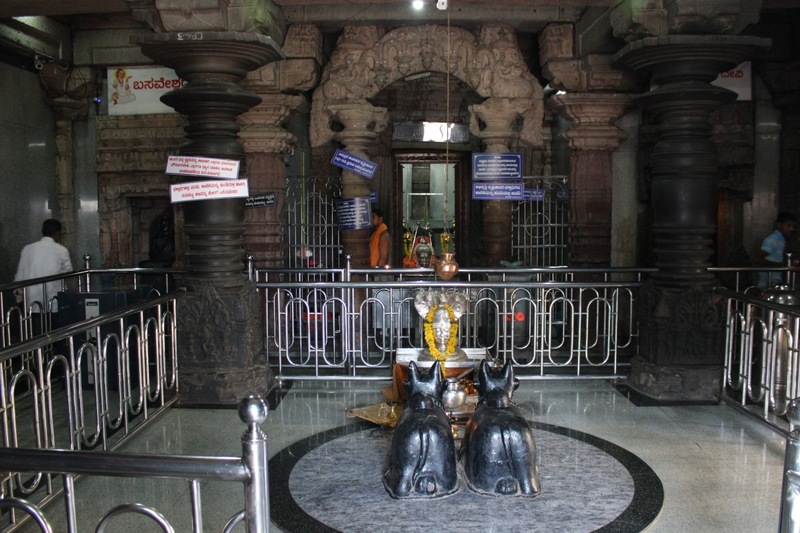 The temple interior has 4 parts - Mukhamantapa, Navaranga, Antarala and Garbhagriha. The centre of Navaranga is a dance floor surrounded by 4 beautifully carved pillars. In this hall are idols of Basaveshwara, Neelambike, twin-Basava and Ganapati. 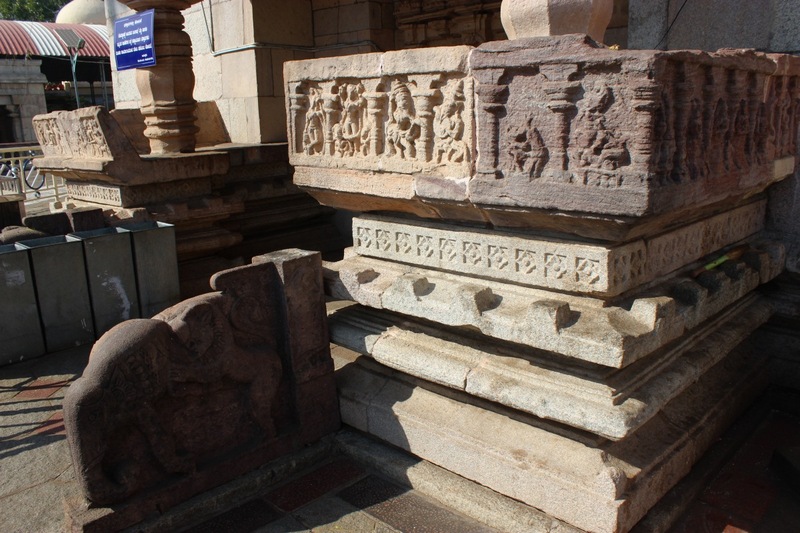 The Garbhagriha is preceded by a Torana, an arch rich in design depicting floral designs and animal figures. 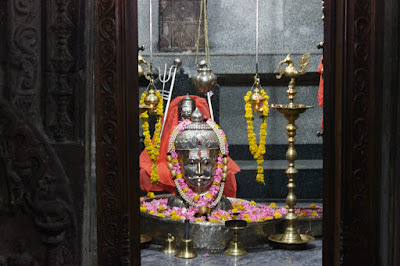 And finally in the Garbhagriha is a Shivalinga known by the name Sangameshwara or Sangamanatha or Sangamadeva. Here's the temple, heavily modified to suit the needs of the day. Recalling from what I remember from the short visit with maternal relatives of early 80s. The temple stood on black-soil courtyard with barely any structure made of cement. The temple all stone structure.. probably its original condition. The circular wall was being built around the Aikya Mantapa which stood in the river bed close to the sloping bank. The well was being built to prevent the Aikya Mantapa from being submerged in Basava Sagar, the reservoir created by Narayanpur Dam. I was disappointed for not having seen the original spot :( I climbed the scaffolding around the well, managed to reach the top and got a glance at the Aikya Mantapa. However, I could not muster the courage to descend into the well. The next visit was in 2009, finally I could see Basavanna's Aikya Mantapa. Coming back to the present.. This is the bathing ghat next to the temple. 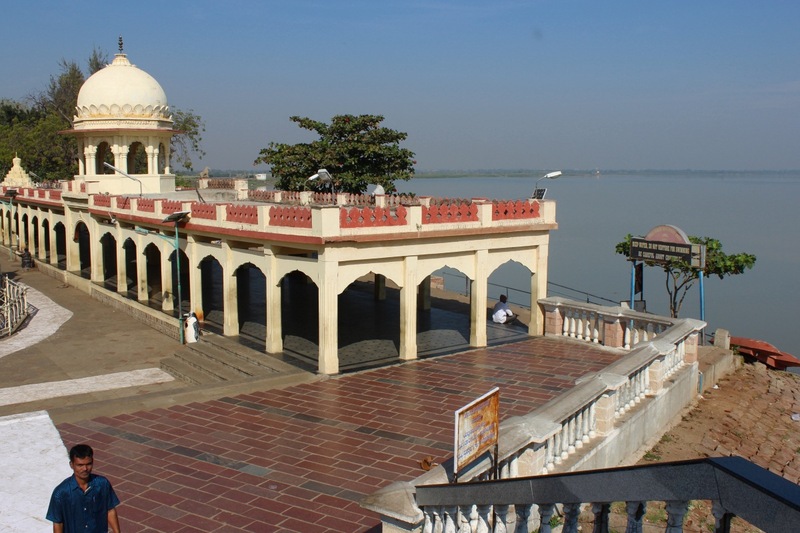 Visitors can take bath in Basava Sagar. This is the east-facing porch of the temple ~ Mukha Mantapa with Sukhanasi. A pair of elephants flank the entrance. One of the beautifully carved tuskers with royal decorations. 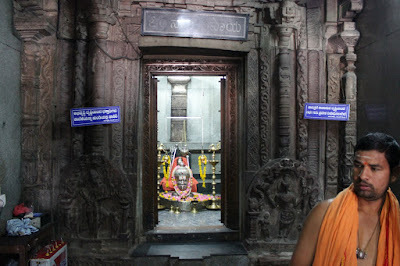 This is the front view of the Navaranga Mantapa. 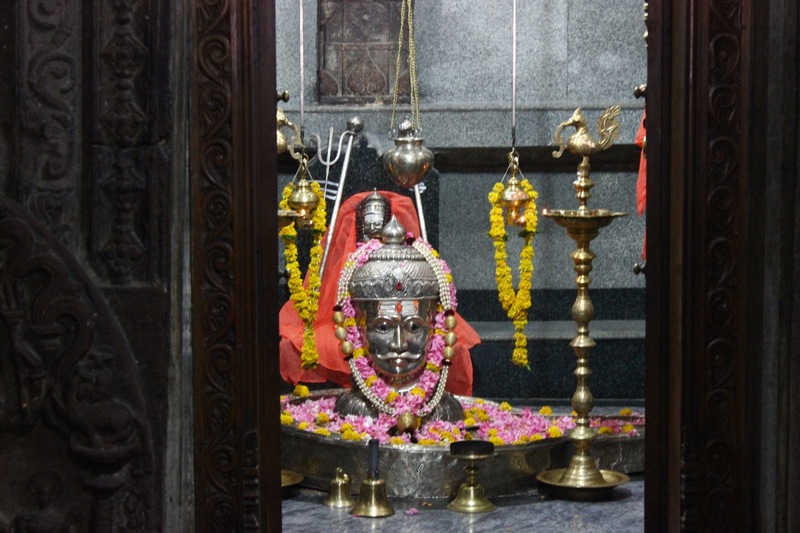 In the center are the pair of the Basavas facing the deity in the Garbhagriha. Check out the Torana (arch) across the vestibule connecting the Navaranga Mantapa and Garbhagriha. 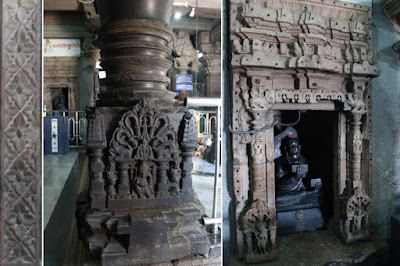 The Garbhagriha door-frame has multiple rings and includes pair of Dwarapala. If you take a close look at the columns and walls, you can see they are pockmarked. Surely those wouldn't be part of original design. I inquired with the priest on duty. Any guesses how? It seems the pits were drilled to fit in decorative lights for a political event! Shocking to know who approved that brilliant idea. Wondering if any of the politicians ever felt a historic monument has been vandalized. 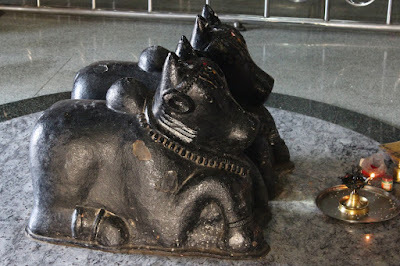 The pair of meditating Nandi. Their posture seems so serene. The rear view of the temple. The lower rear portion is mostly original however the upper half is recently constructed. 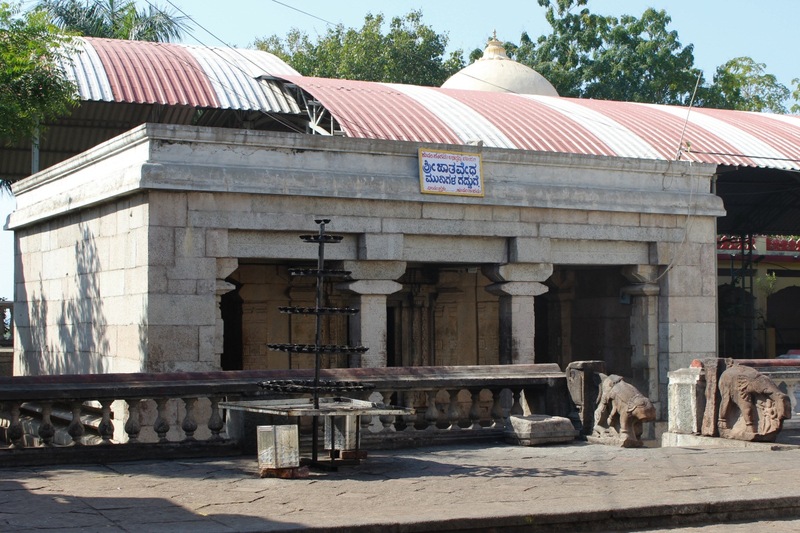 This small plain structure is said to be the tomb of Jatadeva Muni, the ascetic who ran a school where Basaveshwara was a student. 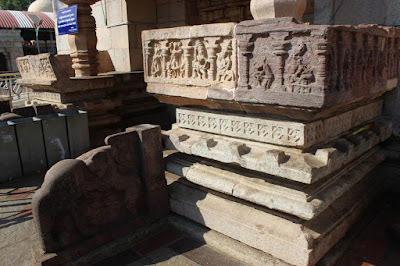 Close to the main entrance of the temple is an inscription in Kannada. The slab is damaged but the letters are legible. 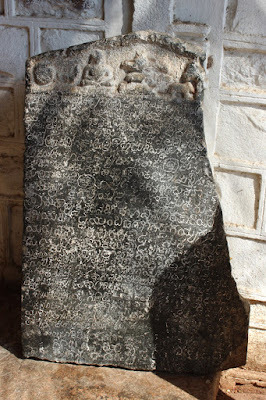 This is one of the two inscriptions found at Kudala Sangama. Besides this temple, there are several modern constructions at Kudala Sangama such as museums and conference halls. Pilgrims visiting the place can stay here and enjoy its peaceful ambiance. 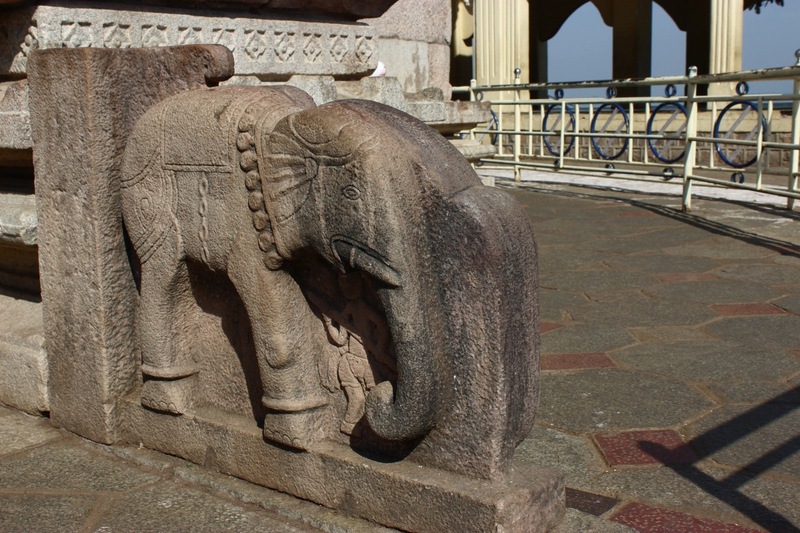 What to see in Bijapur district?